Srila Prabhupada and his early band of disciples played an intrinsic part in the spiritual and cultural revolution of America in the sixties. Both in the Lower East Side of New York in 1966, and in the Haight-Ashbury of San Francisco in 1967, Prabhupada was there, preaching the sublime message of Krishna Consciousness. In fact, Srila Prabhupada -- both figuratively and literally -- put Hare Krishna on the map (above). 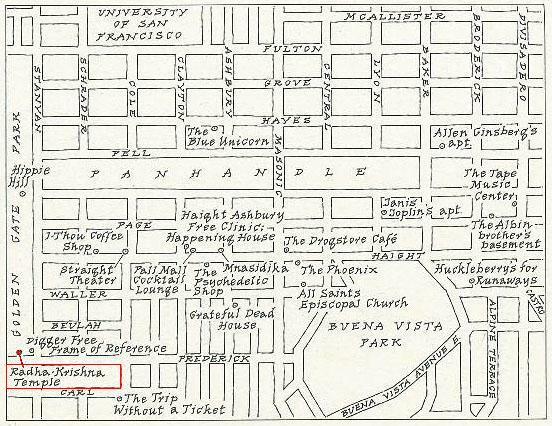 In the lower left diagram of Haight-Ashbury during the historic year of "The Summer of Love," the "Radha Krishna Temple" was established at 518 Frederick Street, nestled right next door to the Digger's Free Frame. 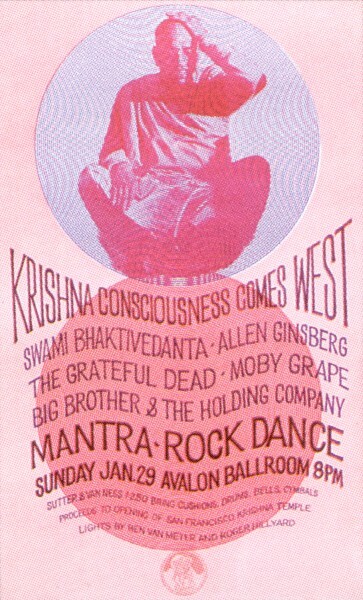 In his book, "The Haight-Ashbury: A History," Charles Perry writes: "Dozens of hippies were quickly converted to Krishna with the aid of a testimonial from Allen Ginsberg, who said that the Hare Krishna mantra 'brings a state of ecstacy.'" By virtue of his complete faith in Krishna and His holy name, Srila Prabhupada quickly established Krishna Consciousness as the genuine "peace and love" movement which so many were earnestly seeking at the time. Thus, his Krishna Consciousness movement spread like wildfire during the sixties and seventies, with enthusiastic support from many of the countercultural heroes of the day. *Click here to see a video of the first San Francisco temple and Rathayatra Festival, 1967.